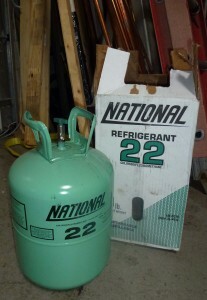 Many commercial HVAC systems contain a substance known as R-22 refrigerant. Many commercial HVAC systems contain a substance known as R-22 refrigerant. However, since this material is harmful to the environment, the EPA has issued guidelines indicating that it will become outlawed. Now that the full ban is imminent, it is important for all building owners to comply. Here is what you need to know. The phaseout of R-22 refrigerant was first mandated back in 2013, but the EPA knew it wasn’t going to be an overnight process. The levels of R-22 that were legally allowed started to drop; the goal is to remove it from circulation entirely. This means that all production stops and all existing stores of R-22 are taken out of usage and disposed of. The production ban goes into full effect at the start of 2020, so there is not much left time for companies that create it to continue their work. Luckily, this doesn’t have to be an obstacle for business owners and property managers. Preparing for the R-22 refrigerant phaseout is much easier than you might think. There are several different options you can try to explore to make this happen. Tracking Residual Usage: Work with your commercial HVAC contractor to find a way to track how much R-22 you are still using, if any. Avoiding waste is important, but at the same time, you need to step down how much of this refrigerant you depend on until you can successfully switch to a different one instead. Performing Retrofits: Another way to make the process easier is to perform retrofits on your equipment. This means changing to different commercial HVAC equipment that uses other forms of refrigerant or replacing components that are no longer functional or useful. Replacing and Upgrading: In some cases, you may need to replace your entire system, R-22 refrigerant is an outdated material that no longer needs to be used, even if it does have some merits. Installing new HVAC technology is more energy-efficient, less noisy, and it ultimately works better. All of that means you need to find the best fit for your environment. Saving energy helps you save money, especially as spring approaches. To learn more about the importance of HVAC Preventive Maintenance, please contact us at 202.600.2787 or mford@crockett-facilities.com. Our PM contract customers receive priority service with 24/7 emergency service in Maryland, Virginia and Washington, DC. Follow us on Facebook, Twitter, Google+, LinkedIn, and Pinterest! This entry was posted on Friday, February 8th, 2019	at 12:14 pm	and is filed under R22 Refrigerant Phaseout . You can follow any responses to this entry through the RSS 2.0 feed. Both comments and pings are currently closed.